The final edition of the 21” Beovision MX series was presented and marketed as the latest variation of a successful and very popular theme. The classic appearance looked unchanged and the concept was the same: a quality medium size TV set that could easily be connected to other B&O equipment. Text copyright © Beocentral. Unauthorised reproduction prohibited. Inside though things had changed radically. A new chassis using similar printed panels to those found in the BeoVision 1 but arranged differently to fit into the MX cabinet was employed, along with a tube with a completely flat screen from Panasonic. Even though the screen was flat the cabinet and contrast screen retained the familiar and elegant bow fronted profile, so there was more space between the tube face and the contrast screen than there was with the earlier models. To prevent distracting reflections, some of the surfaces surrounding the tube were covered in anti-reflective materials. Text copyright © Beocentral. Unauthorised reproduction prohibited. Even arranging the working parts of the set in a way that best matched the shape of the MX cabinet did not allow the new chassis to be fitted without some alterations to the shape of the set. The rear cover gained a pregnant bulge that slightly spoiled the sharp MX shape. The socket panel was also much larger than before but all the connections were nicely recessed to keep things neat. Text copyright © Beocentral. Unauthorised reproduction prohibited. The use of the BeoVision 1 type chassis brought with it some BeoVision 1 type features, such as the Beovision 1 menu system, the option of a set top box controller or a Masterlink interface and a pin code protection system to discourage theft. On a more mundane level, a mains switch was also fitted, something that the previous MX 4000 didn’t have. For the first time in a small MX series set, the “log line” loading tubes for two loudspeakers were not present, instead both drive units were housed in a common bass reflex enclosure. Text copyright © Beocentral. Unauthorised reproduction prohibited. 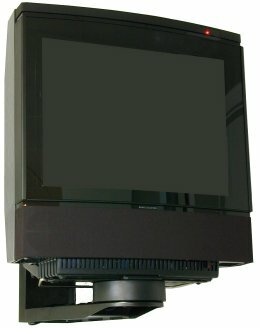 The BeoVision MX 4200 replaced both the MX 4000 and the MX 4002. When it was discontinued, its position in the range was taken by the BeoVision 6, though this was considerably more expensive. Text copyright © Beocentral. Unauthorised reproduction prohibited.